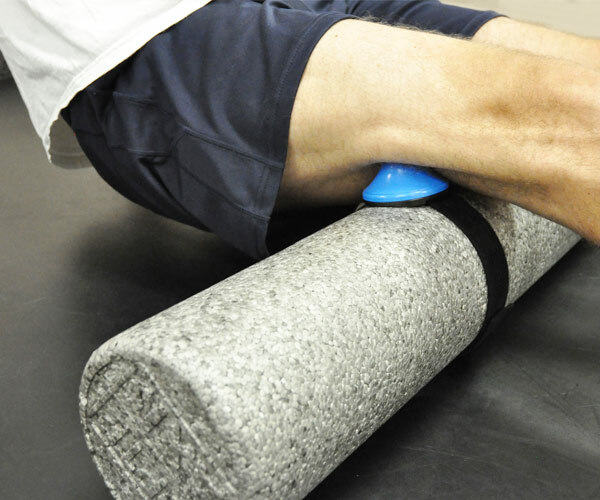 A 500 on a foam roll is shown. 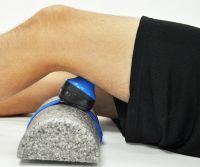 The foam roll is being used to compensate for the bend of the leg and can also–with the users buttocks lifted off the floor–be used to achieve an intense kneading pressure. Sit with your feet and buttocks on the floor and your knee bent over your TolaPoint. 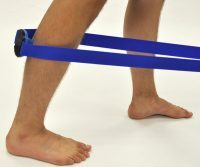 Keeping the foot of your unaffected leg on the floor, relax your affected hamstring and staighten your affected leg. 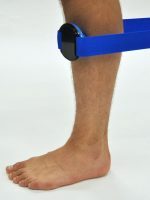 Let the weight of your leg generate pressure as required. For more pressure, lift yourself off the floor with your arms and shift your weight toward the Point.